We already prepared the book for an update. The Twister epics are included now and will be added soon. Finally, all in-game items will be in the book. It is very nice indeed. Last edited by Kiengaard; 13th November 2018 at 03:17 PM. So which XP Bonus is being utilized currently? Why is this game content on making the worst possible choices? 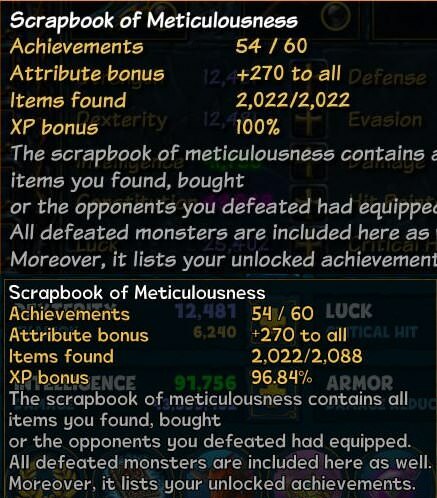 Let's add new items and monsters to scrapbook every 2 years and decrease everyone's percentage until they get it again, again and again. Every 2 years, do it or you lose. Let's add new items and monsters but NOT make them count, so they are not decreasing and people won't hate you for adding new items/monsters because of the constant hamster wheel of the scrapbook and we can add them freely. Let's add new items and monsters and ADD them over 100% so that everyone will look forward to getting them, extra percent and you designing new monsters/items. As it stands currently - I DON'T want you to add new items/monsters to the game because it means I will have to play around lvl 20 content yet AGAIN (this has happened before, is happening now and WILL happen again) and not so that I get more from it, but so that I don't lose what I already have. What next, are you gonna add a new mirror shard so that everyone over 400 can finally quit? This game constantly makes choices that alienate people that aren't new players, every step of the way. Funny thing is that in this case, nobody wins, it's just older players losing more than new. I asked the coders and it is only a visible change. The new number of stickers is displayed BUT your bonus is not affected. You do not lose XP. It is not new items by the way...we will only add those currently missing in the scrapbook (the epics you can unlock in the Twister for example). The more we complain, the less playa understand what we ask for.